Shale shaker is well used in oil and gas drilling solids control system to treat drill mud and recycle drill mud for re-use. In oil slurry separation, if it contains a lot large solids particles, a shaker will be used before further treatment to separate large solids particles out to reduce work load for following equipment. AIPU delivery a very compact design shaker tank for oil slurry separation to China work site and delivery to work site yesterday. 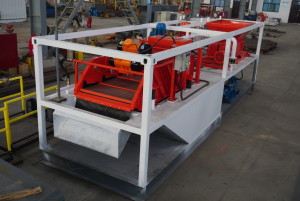 The shaker model selection will depending on waste oil slurry conditions, normally 3 or 4 decks will well used because of large working capacity with linear motion design for steady working. 1. 1 Hopper for collect oil slurry into shaker tank for further treatment. It is a cutting machine to cut the very larger particles though hopper and discharge oil slurry into first compartment of shaker tank. 2. A set of vertical slurry pump set in first tank compartment and suction oil slurry into shale shaker at a designed speed. 3. 1 set single deck linear motion shale shaker with 3 panel shaker screen for treating capacity 30 to 50 tons oil slurry depending on slurry condition. 4. 20 feet container size frame with container locking corner for lifting and delivery. There is a small tank divided into 2 compartments to hold oil slurry. The former shaker tank is mechanical separation of oil slurry, we do the further oil slurry treatment by hot water washing principle to separate oil from oil slurry and produce clean solids and reuse of hot water and zero water discharge make whole system suit drill site very much. I will update more technical introduction of AIPU oil slurry separation system soon or please contact me freely for technical or commercial support.